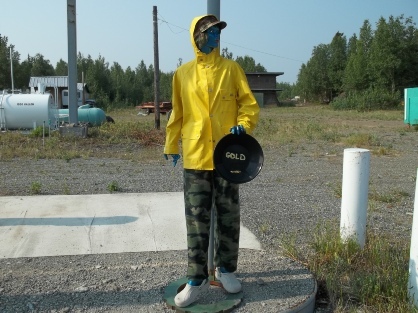 We found this blue lady standing next to a cabin in a yard in the middle of Alaska and I had to ask myself “did she freeze and turn blue during the long cold winter months”? Once they got her dressed with a cap and a rain coat they put the gold pan in her hand. 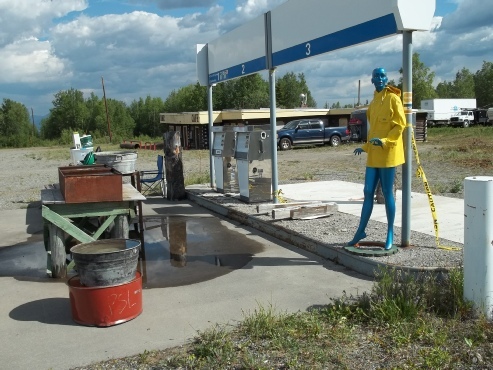 Then they put pants and a pair of shoes on the blue lady. 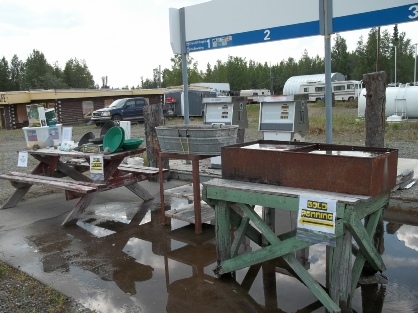 Then they set up tubs on tables and put water in them. 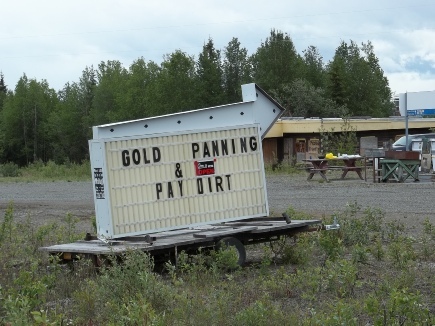 Then last but not least they moved a sign on a trailer close to the highway and all of a sudden they were in business offering gold panning and gold pay dirt to visitors who drive to Alaska through Canada on the Alcan Highway and take the Tok Cutoff to southern Alaska which passes in front of their property. 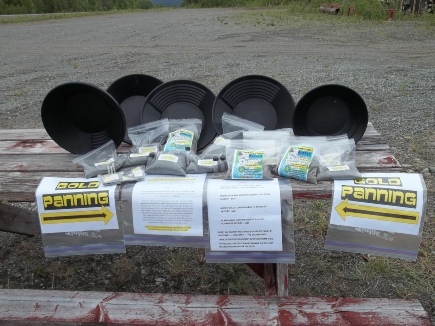 By the way - this gold panning business is located at Mile 62 on the Tok Cutoff Highway between Tok and Glennallen Alaska if you happen to be driving to Alaska during the summer months. 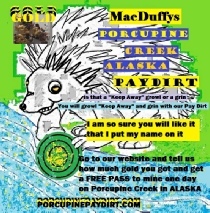 After watching and taking photos all of this activity I could not resist trying my hand at gold panning so I bought one of the bags and in about ten minutes I was holding at least a gram of gold in my hand which is more gold than I could have found after working all day in a creek and they even put the gold in a glass vial for me. 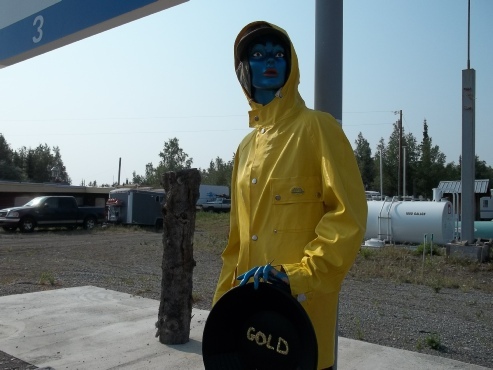 Then the resident of the cabin came out and picked up the blue lady and moved her to an area closer to the highway that passed by the property and put a rain jacket on her. 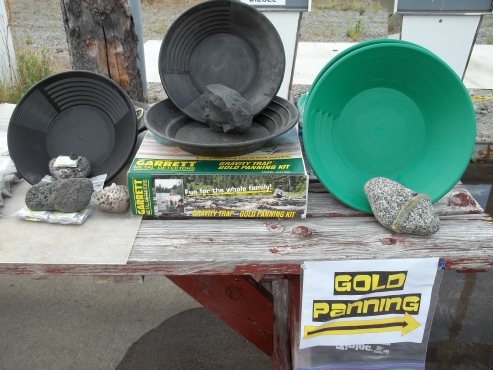 Then a lady came out of a RV with a gold pan in her hand that had “GOLD” on it.